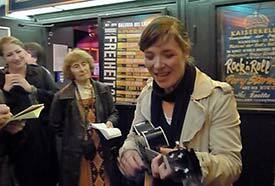 ABOVE: Stefanie Hempel sings "Rock and Roll Music" outside the Kaiserkeller, a club where the Beatles played up to half a dozen sets per day in 1960. In 2009, The Times announced that "Hamburg rebrands itself as Beatles City." The intersection of Grosse Freiheit Strasse and the Reeperbahn was renamed "Beatles Platz," a Beatles monument was erected, and a Beatlemania museum opened with five floors of exhibits about the Fab Four. Still, all of those attractions are Johann-come-latelys in comparison to Hempel's Beatles-Tour, which singer-songwriter Stefanie Hempel has offered since 2004. Stefanie Hempel's walking tour takes you to the most important Beatles sites in the area around Grosse Freiheit and the Reeperbahn, including clubs such as the Indra Club and the Kaiserkeller and the site of the Star Club (which burned down in 1987). Ms. Hempel describes places where the band lived (e.g., behind the screen of a movie theatre) and their busy performance schedule (five or six sets per night, seven days a week). Along the way, Stefanie Hempel sings Beatles songs--in public, on the sidewalk--to the accompaniment of her trademark ukelele. If you're interested in Beatles history, the tour is indispensable, but it's great fun even if you aren't a diehard Beatles fan. Hempel's Beatles-Tour is normally offered on Saturday evenings at 7 p.m. (and possibly on other days, depending on the season, public demand, and the singer-songerwriter's performance schedule). For more information, including an inquiry form, visit the Hempel's Beatles-Tour Web site. Also see hempelmusik.de for more about Ms. Hempel and her own musical career. To see photos from the tour, go to page 2 of this article. A video is on page 3.